Remember sitting on the curb as a kid and waiting for the parade to start? Straining to look far down the street and listening intently for that faint sound of a distant marching band, you knew that once the first float rolled into sight, the crowd would erupt with elated cheers. 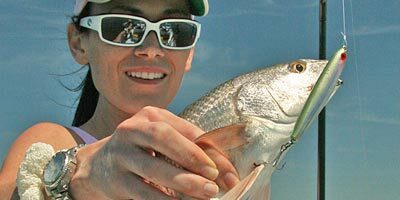 That's how it is for Florida's Gulf Coast redfish at the warm season's outset. In early spring, Capt. Geoff Page expects to find his redfish over shallow grass flats in one to three feet. With inland waters still in the low to mid-70s, the fish have yet to school up noticeably, so finding a handful of ready fish is wiser than hunting numbers. Having spent their winter months focused on crabs, shrimp and invertebrates, the bronze bombers have turned their attention to finfish now that the bait schools have started rolling down the beach and into the bays. This sparks the annual explosion of redfish action. "The first thing you'll see is the glass minnows; then before you know it, the pinfish and sardines will show up," Page said. "You can tell it's spring when you can see glass minnows raining on the top, sardines flashing in the mid-depths and the pinfish flashing at the bottom. The reds will gang up and push the bait. They'll be sipping glass minnows and crashing the sardines. "The fish are very hungry because they've been laid up for so long. They haven't eaten a finfish since November, so they're very aggressive once the bait arrives." Page typically targets reds with a soft jerkbait like a Saltwater Assassin, MirrOlure Little John or the Rapala Trigger X on a 1/8-ounce jighead - or a 1/4-ounce when potholes abound. For hard baits, he likes a Rapala Subwalk, Sebile Stick Shad or a MirrOlure MirrOmullet. His best advice to early spring redfish seekers in the Bradenton-Sarasota area is to target grass flats in Palma Sola, Terra Ceia and North Sarasota Bay. Farther south in Charlotte Harbor, he likes the mouths of Widdens Creek, Catfish Creek and the outside of Bull Bay. Warm, sunny days, incoming tides and just enough breeze to break up the surface is his recipe for success. Page's Tip: "Stay on flats near inlets because that's where the first push of bait will come in. Once it comes in, it will disperse into the upper bays, but those outer flats will get the first push." In Tampa Bay, Capt. Billy Miller will find redfish by looking for mullet working the edges of sandbars and islands around Fort Desoto, Tarpon Key, Cockroach Bay and Bishops Harbor. These fish see a lot of boats, so Miller said a stealth approach is paramount. "Set up ahead of the mullet," he said. "As the mullet make their way to you, cast to the edges of the school, rather than the middle. Also, look at where the mullet are on the flat in relation to the tide. This will let you know where the redfish will be laying. At low tide, the mullet will be on the outside bar; high tide, they will be on the islands and oyster bars." Live whitebait and pinfish are redfish favorites, but Miller said heavy pressure has educated the fish. Dead baits have been the latest craze, so cut some ladyfish or mullet chunks, or fish dead sardines, pinfish or greenbacks. Also working Sarasota Bay and Charlotte Harbor, Capt. Rick Grassett blind casts grass flats where he focuses on the seams of grass and sand or drop-offs. He'll fish a variety of plastic tails on DOA CAL jigs to determine what the fish want. A master fly fishing instructor, Grassett also tempts reds with spoon flies and his namesake Flats Minnow on floating line with a 12-foot leader. Northward, in the Homosassa area, Capt. William Toney finds early spring redfish moving from coastal rivers and backcountry toward the Gulf islands. He'll pole his boat and look for reds on rocky points and shorelines. The fish will move up to the rocks with rising tides to reach the buffet of crabs, shrimp and baitfish hiding there. Toney prefers 3-inch D.O.A. shrimp, MirrOlure MirrOdine and Top Dogs. A 1/4-ounce Eppinger Rex spoon offers great casting distance, but Toney said this one takes practice to avoid snagging in the shallow rocks. His advice: As soon as the spoon hits the water, close the bail and start a fast retrieve. Reds will dart from the rocks to grab it. Wherever you chase redfish, follow Miller's advice on stealth. First, most redfish from Tampa Bay to Charlotte Harbor recognize the sound of a trolling motor, so if you use one, keep it on low power and don't alter the speed, as the variance will spook the fish. Also, Miller notes, pay attention to how your boat positioning and related noise may affect other anglers. It's hard to find complete solitude these days, but courtesy goes a long way in making sure everyone gets a fair shot at spring reds. "This is a time of year for patience so if another boat is working a school of redfish, be courteous and wait your turn," Miller said. "A school of fish with five boats on them will never be very productive." For redfish guidance, contact Page (941-586-3756), Miller (813-363-9927), Grassett (941-923-7799) or Toney (352-621-9284).